Although differing in setting and frame details, these two portraits need to be preserved together as a pair as they depict a young mother and her baby. The bright-eyed baby girl, wearing a traditional white dress and a cute bonnet trimmed with blue ribbon, is holding a few sprigs of forget-me-not flowers and is seated on a large purple and gold cushion before a draped window looking out on a landscape with hills and trees. 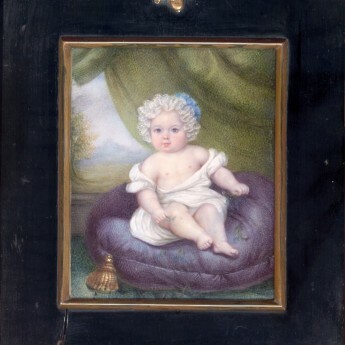 A label on the reverse of the frame identifies the child as Philippa Maria Ramsey of Tusmore Park. 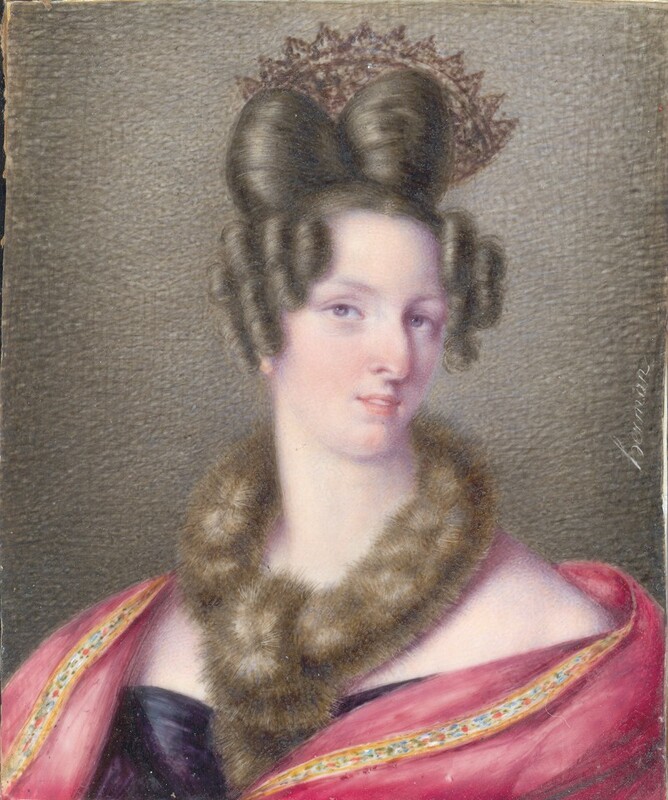 The second portrait portrays the child’s mother, Maria, in a pretty floral-edged pink wrap with a fur boa. 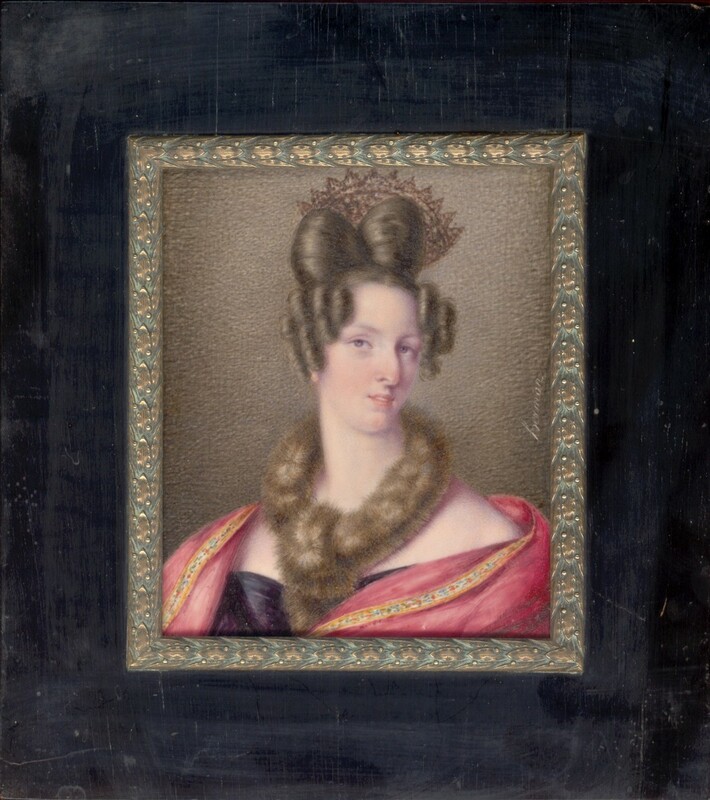 Her hair is arranged in an eye-catching apollo knot secured with an elaborate tortoiseshell comb, tight curls framing her face. In 1828 William Fermor died without a male heir and left Tusmore Park, a large Palladium style house set in a 3,000 acre estate, to his adopted daughter Maria Whitehead. 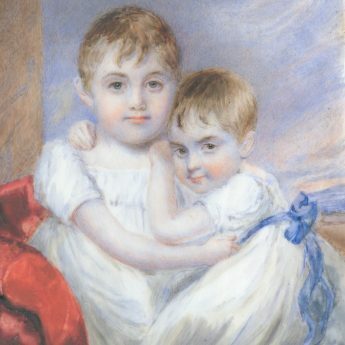 Maria married John Turner Ramsey and in 1831/2 their daughter, Philippa Maria, was born. Twenty years later in February 1852 Philippa Maria married William Wemyss Methven Dewar continuing to live at Tusmore Park. 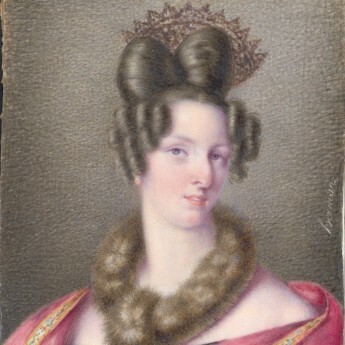 Sadly she died in July 1853, possibly in childbirth. Her husband remarried in 1857 and her parents sold the Tusmore estate in the same year to Henry Howard, 2nd Earl of Effingham. 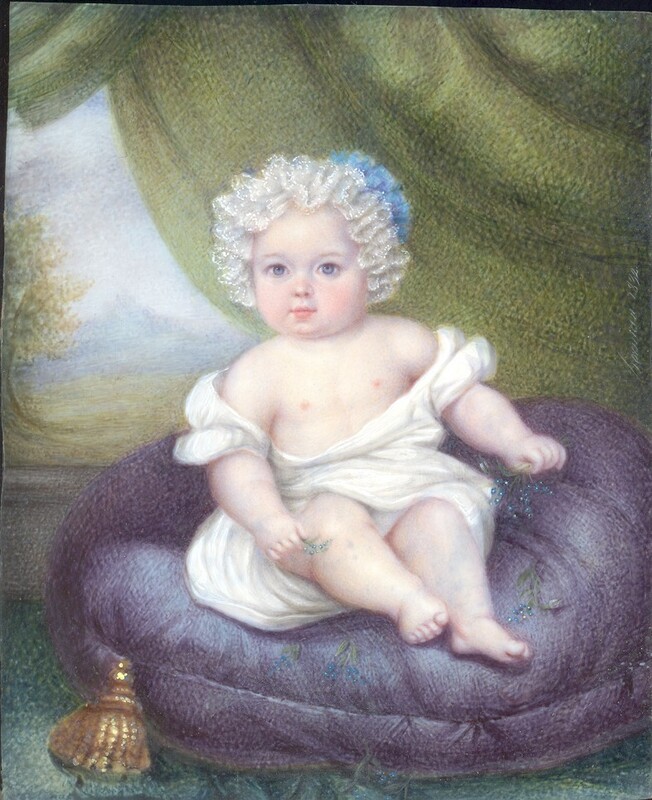 Both portraits are signed ‘herman’ and that of the child is also dated 1832. 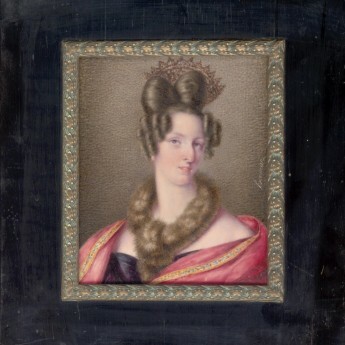 The portraits are housed in later ebonised frames with brass surrounds, hanging rings and easel stands. One frame is cracked bottom left though remains stable. 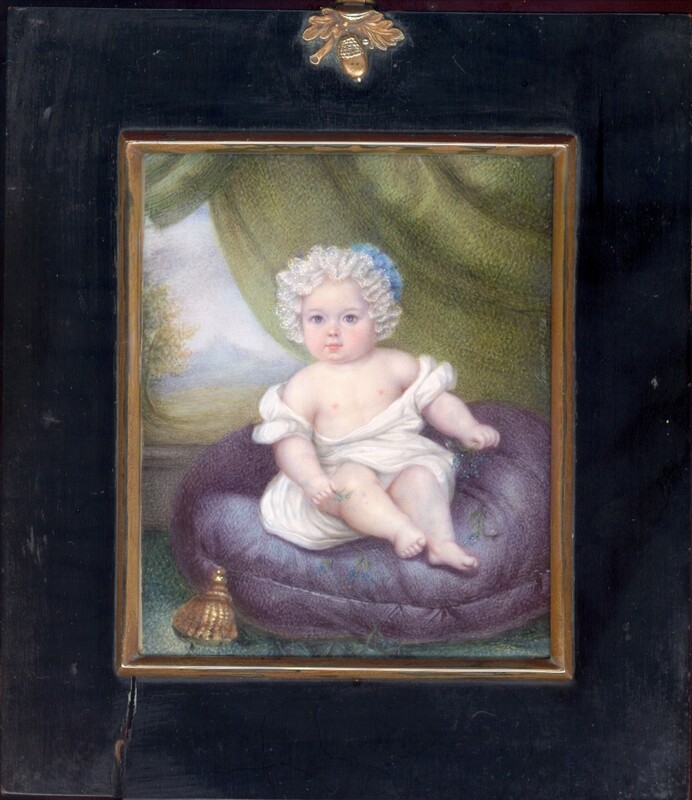 Although listed by Schidlof and Foskett, little is know about the miniature painter Herman who was working between 1820 and 1840. His work is critically well considered though.